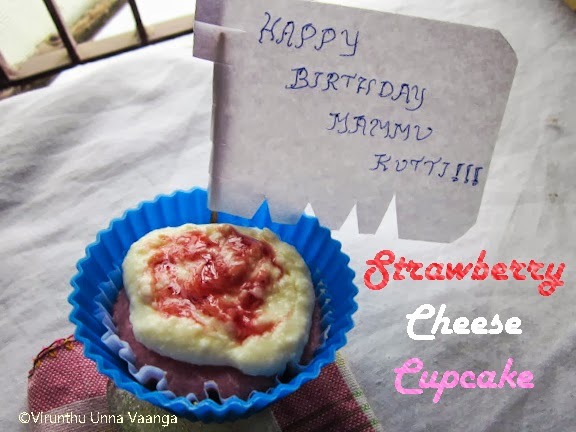 VIRUNTHU UNNA VAANGA: STRAWBERRY CHEESE CUPCAKE (NO BAKE) - A VIRTUAL BIRTHDAY TREAT FOR TRINAYA!!! 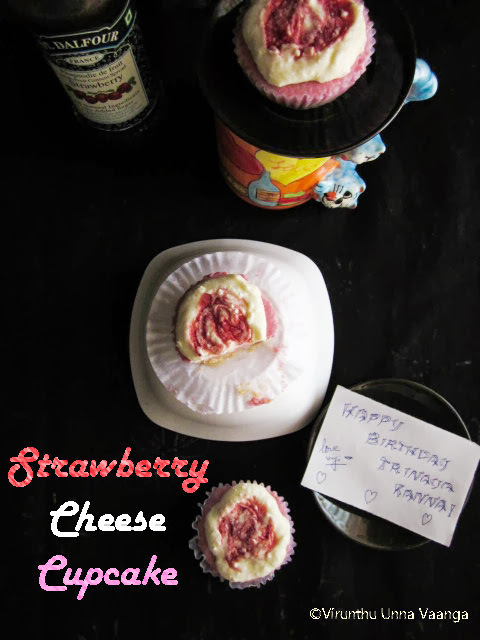 STRAWBERRY CHEESE CUPCAKE (NO BAKE) - A VIRTUAL BIRTHDAY TREAT FOR TRINAYA!!! She is such a lovable and cute kid, I admired her each and every activities, which is amazing matured, intelligence and caring nature. 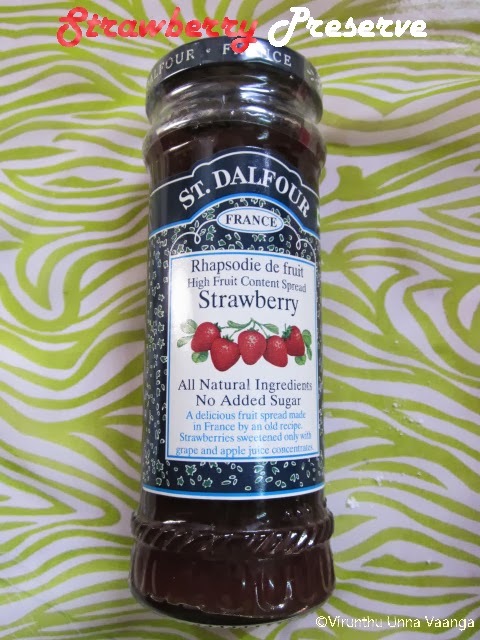 If you allowed me to talk about her, there is no full stop for the post. 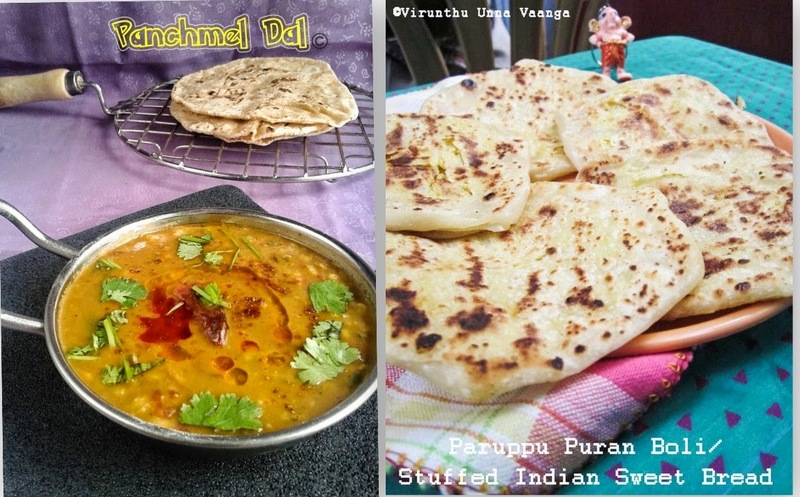 Blend fresh paneer, powder sugar with very little water which is enough for smooth grinding. Take out 2 Tbsp of the paneer mixture into the separate bowl and add vanilla essence, mix it well and keep it aside. 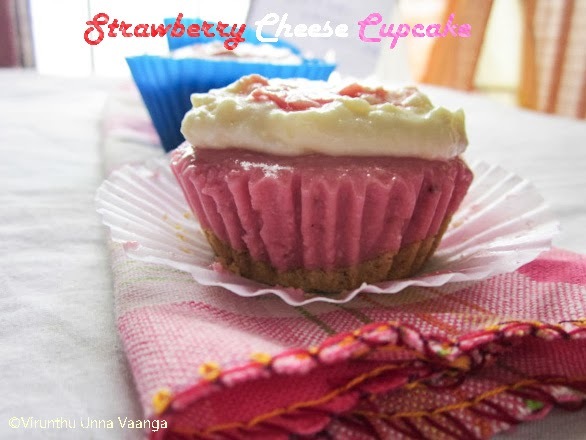 To the remaining paneer mixture add strawberry preserve and strawberry essence and blend it well and keep it in another bowl. 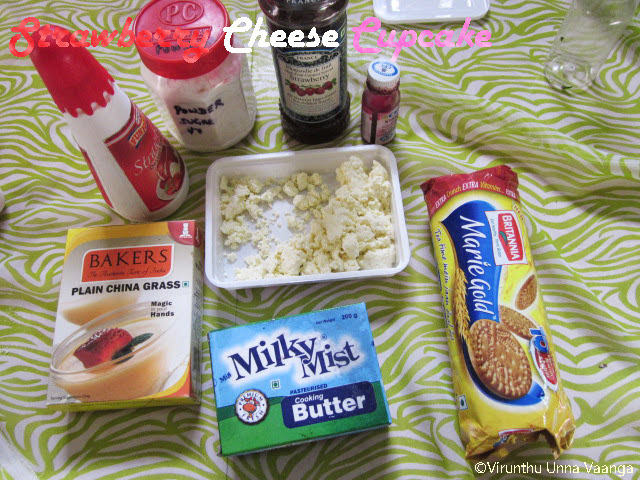 Break the marie biscuits and blend it into coarse mixture, keep it in a bowl then add melted butter and mix it well. 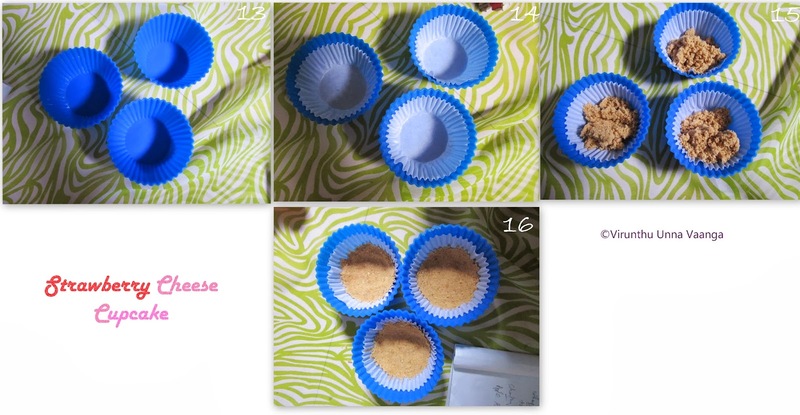 Take the cup cake mold and place the muffin liners, add 1 Tbsp of biscuit crust for the base, level it and keep it in freezer for 15 minutes to set. 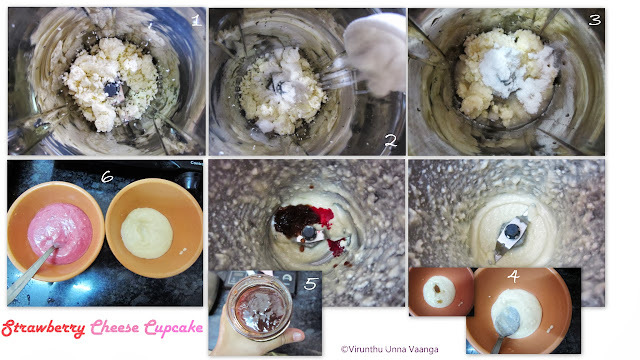 Meanwhile, wash the agar-agar (Vegetarian gelatin) flakes, and boil it in water till completely dissolves. 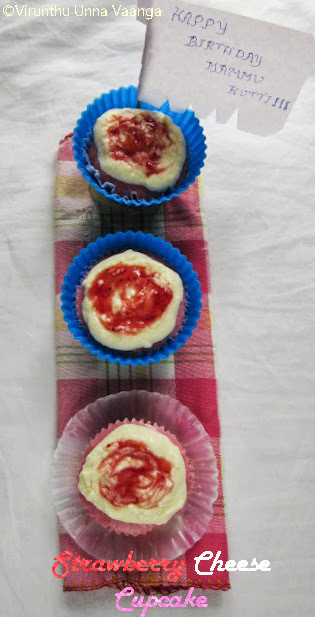 Take the strawberry paneer mixture, to this add 2 Tbsp of agar-agar solution mix it well then pour the mixture into the every muffin liners as shown in the picture. 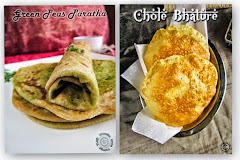 Keep it in refrigeration or freezer to set well. Now lightly heat the agar mixture to dissolve (by the time it may be set), add 2 Tbsp of agar mixture to the white paneer mixture and pour over the strawberry layer. 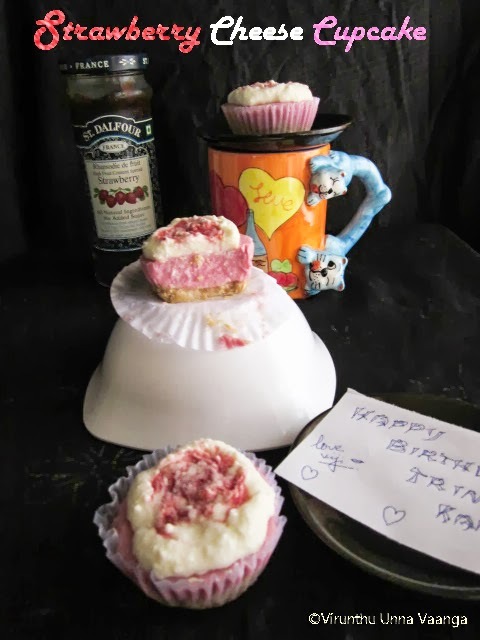 (Actually I tried to make layered cheese cake but demand of ingredients I could not). 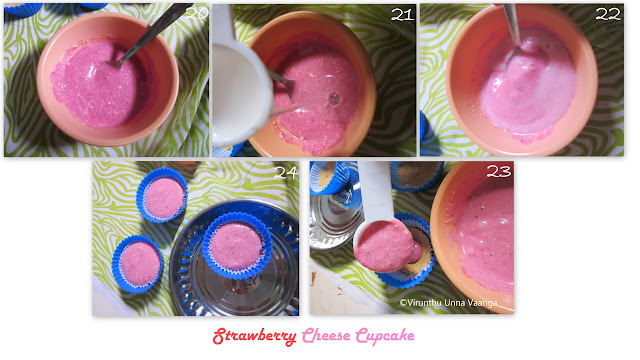 Now take the strawberry toppings or jam mix it well and add drops over the white layer and make swirl effect (Mine got flopped :P)using tooth pick and keep it in refrigeration till it set well. 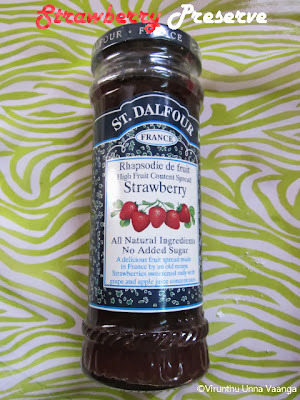 You can substitute the strawberry preserve with fresh or frozen strawberries. 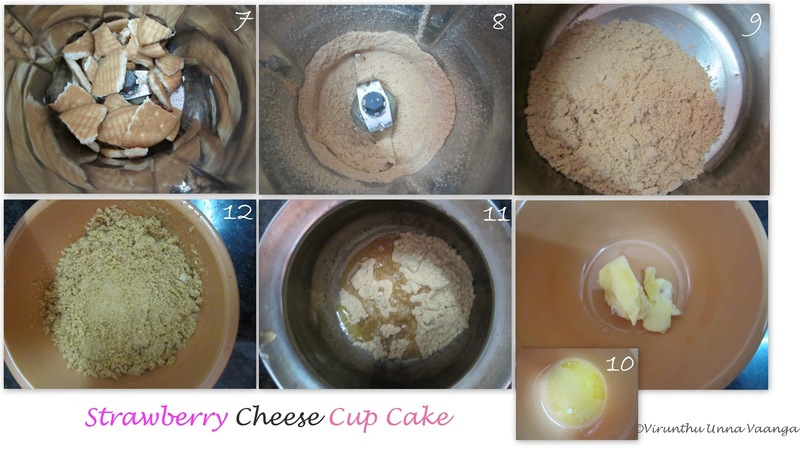 Can make the cake in spring pan too if you need in big size according to the high quantity. May use agar-agar powder or gelatin in place of agar agar flakes. If you want rich flavor can add cream cheese and yogurt while blending. 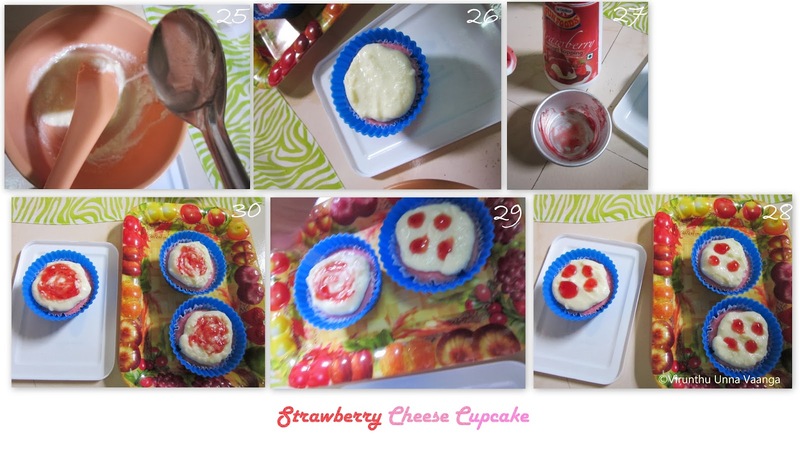 ENJOY THE CHILLED STRAWBERRY FLAVORED DESSERT!!! 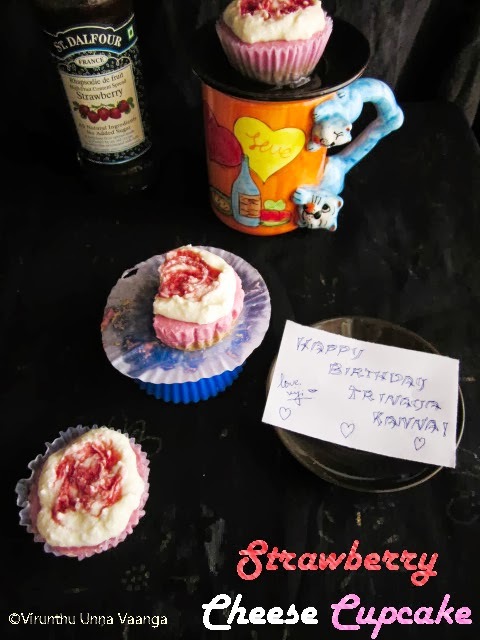 Happy birthday to the lil darling, may god bless here.. 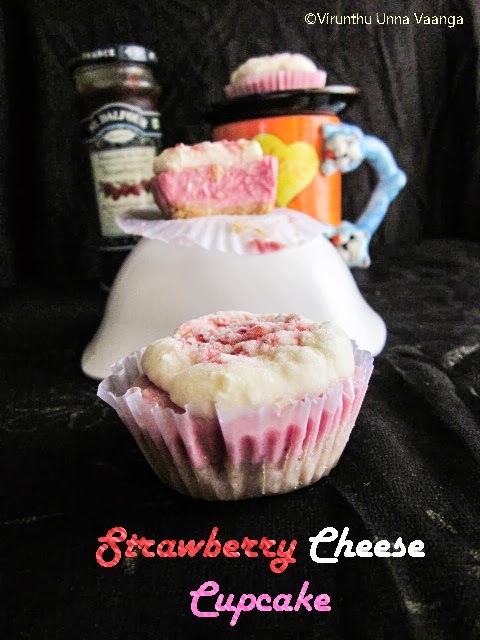 Cheese cupcake sounds a brilliant idea, very cute looking cheesecake. 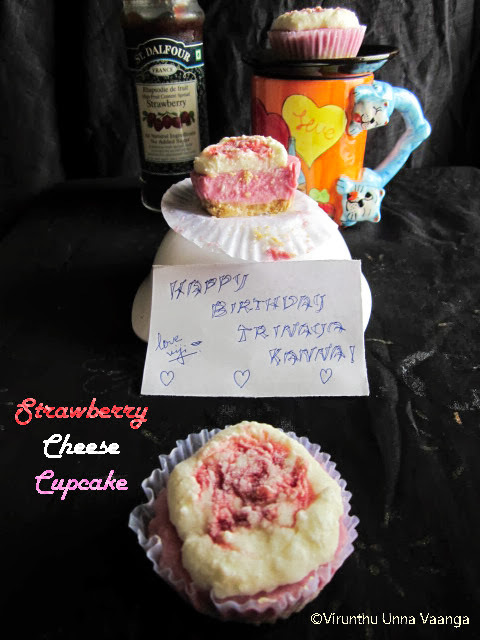 Belated birthday wishes to Trinaya kutty, so creamy n delicious cheese cake viji...well done dear! 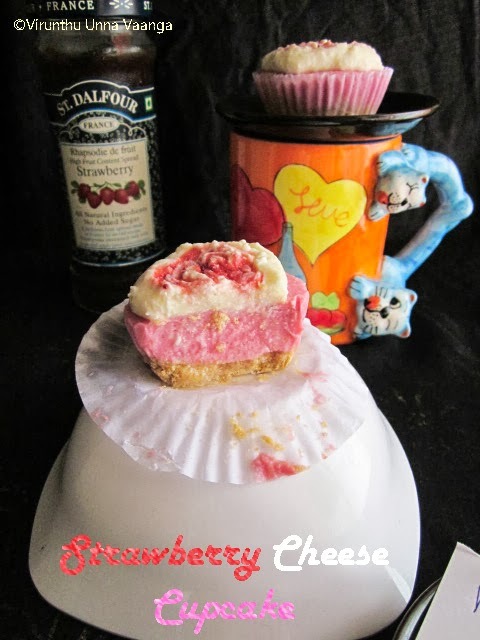 loved this no-bake strawberry cheese cake..kids will definitely like this..thanks for linking with us!